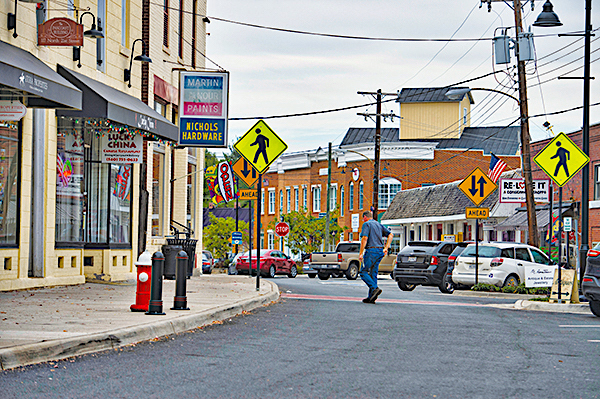 For the past 10 months, the Purcellville planning staff has been collecting and documenting public input about the future of the town. Now it is time to begin drafting the new Town Plan that will implement those priorities. The final two comprehensive plan public workshops were held Nov. 5, but residents can continue to share their ideas on the town website through Nov. 30. The comments gathered during the year have produced a good idea of what residents want to see in the town, Senior Planner Daniel Galindo said. “A lot of the input shows broad agreement that the community values a sense of place and character, and that’s what they want to see,” he said. Another key objective is “a focus on homegrown businesses rather than chains.” That has been a sentiment for more than a decade as the town previously adopted rules requiring “big box” retailers to undergo special exception review. Residents also want to control the scale, building height and architectural design in the historic corridor overlay district, Galindo said. The Board of Architectural Review has control over non-residential projects. The Vineyard Square downtown redevelopment project on 21st Street raised significant public opposition on those grounds. Although the project was approved in 2013, it has not yet moved to construction. The new Town Council is addressing those concerns, moving ahead with Zoning Ordinance amendments that would lower the maximum height of buildings in the historic corridor district. The Planning Commission will be taking up the issue. “I think they want to lower the height to be more in keeping with the existing streetscape, to retain its character,” Community Development Director Patrick Sullivan said, noting the average height on the east side of 21st Street is 45 feet. The two highest buildings on 21st Street are the former mills, now converted to office and retail space (Trail’s End Cycling Co.) and Magnolias at the Mill restaurant. The public comments on the plan emphasized that residents want to look for development opportunities inside the town, promoting infill and redevelopment as a priority. “People want us to have a plan to reasonably control growth and development, that captures that [desire] in a way that is specific—that says, “this is what we want,’” and not leave too much open to debate, Galindo said. While the council has shown little interest in expanding the town’s borders, public comments on the plan made it clear residents were not necessarily opposed to annexations in the future. But they wanted to have well-reasoned information available to look at the options. Recently, the council adopted a resolution that amended the initial scope of the comprehensive plan review—removing language that expressed a desire to see land use plans for the joint land management area adjacent to the town’s boundaries, Galindo said. Last week, the council voted unanimously to deny Brad Kline’s request to annex his Purcellville Crossroads mixed-use project on the west side of Rt. 287 and north of the Rt. 7 Bypass. Town planners hope to have a draft of the revised Town Plan ready for review and public feedback in January, Galindo said. Then the planning team—comprised of McBride Dale Clarion, lead facilitator Emily Crowe; Kimley Horn engineering group, facilitator David Whyte; and economic and planning consultant Tischler Bise, facilitator I. Carson Bise II, and Galindo—will hold an open house for the public. The Planning Commission will hold a formal public hearing on the plan and make its revisions before sending the document to the Town Council for adoption. “That would be early summer, June at the earliest,” Galindo said. To learn more or to contribute additional ideas before the end of the month, go to planpurcellville.com.